A very busy year is behind us. We have disseminated our first results via teaching in the University of Helsinki where a new Master´s Programme in Russian Studies (https://www.helsinki.fi/en/programmes/master/russian-studies) started in the fall. The team members have been responsible for two courses, namely “Global Indicators of Good Governance and Law in Russia” and “Global Processes and Flows in Russia”. These courses covered such themes as hybrid regimes, the rule-of-law, global migration trends, Central Asian labour migration to Russia, impact of migration to societal transformation and globalization of religion. In December, our team was strengthened with a new member, Sherzod Eraliev, who finished his PhD in the University of Tsukuba, Japan, and will work on turning his manuscript on Russian migration policy into a book to be published by an international publisher. Among other things, Sherzod has previously written about the connection between migration and religiosity (Journal of International and Advanced Japanese Studies). He argues that the living conditions of a labour migrant, the environment in which he lives, and circumstances he faces every day in Russia incline and push him to seek solace and comfort in religion. It is suggested that the feelings of insecurity—not only economic (mostly in terms of finding a job), but also psychological and existential—are critical factors in such circumstances. Previous research on immigrant religiosity in the West has mostly focused on economic and, to a lesser degree, existential aspects of insecurity while explaining the religious behaviour of immigrants. However, while not ignoring the importance of feelings of economic security, in the Russian case, psychological and existential (physical) insecurities play a more apparent role in affecting the religious behaviour of many Central Asian labour migrants. In this regard, by examining more deeply the migrants’ feelings of insecurity, specific aspects peculiar to the growing religiosity among Central Asian migrants in Russia can be explored. Finally, our year ended with Rustam receiving a 3-year funding from the University of Helsinki to carry out a comparative study on Russian and Turkish immigration policies. This project will further strengthen our joint efforts by bringing in a PhD candidate this year, and by adding value to the our project´s scientific goals. This entry was posted in Yleinen on 10.1.2019 by aheusala. This year has included several tasks related to policy expertise and media contacts. Kaarina and Anna-Liisa were invited to participate in the making of a Finnish government research report on Russia´s security developments. The insights which we have gained in the MISHA project have been utilized in the making of the part ”Internal security” in the report to be published by Finnish Ministry of Defence in early 2019. Russian migration and its connection to wider security issues are recognized as important matters for Finland as a neighbouring society. 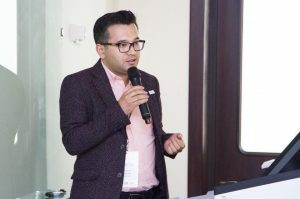 Meanwhile, Rustam has been invited to serve as an expert on corruption and governance for the newly established Expert Council “Buyuk Kelajak” which aims to assist Uzbek government in designing the long-term development model of Uzbekistan until 2035. He participated in an international conference “Uzbekistan 2035” in Tashkent on the 28-29th of June, where his talk on anti-corruption reforms prompted great interest by the Uzbek government, among others the Ministry of Justice and the Academy of General Prosecutor’s Office. It is very gratifying to see how our work bears fruit at this level of societal relevance! Media has approached us several times this year. This has given us an o pportunity to participate in wider societal and political discussions on Russia´s developments. 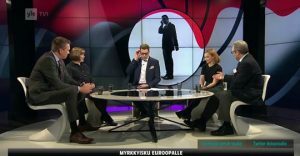 The year started with an appearance in a Finnish broadcasting company YLE´s political talk show (5.4.2018, A-Studio:Talk, journalist Jan Andersson) in which Anna-Liisa discussed difficult Russia-EU relations. Because of Mr Trump´s and Mr Putin´s Helsinki Summit on the 16th, July became a hot month – and not just because of the unusually long humid and hot weather in Scandinavia. During the summit, Anna-Liisa participated in the yearly SuomiAreena event, organized by the Finnish broadcasting company MTV in the city of Pori. This was followed by commentaries in NBC Digital News (journalist Jon Allen), later used by several US and Canadian media outlets, and in Finnish media outlet STT (journalist Mari Areva), later used by Turun Sanomat, Lapin Kansa, Kotimaa and Keskisuomalainen. During Rustam´s late July trip to Moscow, he participated in the BBC Uzbek direct sending and gave an interview for the Radio Free Europe. Finally, in the end of July, two delegations from Japan´s House of Representatives visited Aleksanteri Institute to discuss Russian security policy, hosted by the directors of the Institute and our project PI, Anna-Liisa. She was also invited to participate in the making of an article about Finland´s defence policy for the newspaper Tokyo Shimbun. Media visibility and expert work have gained more importance in our work, and finding a right balance between fundamental research and other activities can be a challenge. ’Societal relevance’ takes time and energy away from reading, writing and thinking – and from holidays! Anyhow, there are hardly any dull moments or lack of surprises in this line of work. This entry was posted in Yleinen on 15.8.2018 by aheusala. On 26-27 of March, a new network of Migration and Informality in Central and Eastern Europe was launched in a workshop organized by Rustam Urinboyev, Rano Turaeva-Hoehne and Abel Polese. The venue was in the beautiful city of Lund, at the Department of Legal Sociology of the Lund University. Altogether 29 scholars and experts gave presentations and participated in lively discussions on our topics. We covered governance of migration and politics, informality and legal system, economy, health and religion related to migration and informality, migration and displacement, and comparative aspects of informality in the post-socialist world. Our team members gave presentations on the effects of the shadow economy on Russian security policy, smartphone transnationalism in the lives of Uzbek migrant workers and religious informal networks and solidarity among Moscow´s Central Asian migrants. The two-day intensive event proved that there is a need for the continuation of this cooperation among people who are studying various sides of informality and migration in the globalized conditions of the post-Soviet space. We also need to include experts who work with migrants and tackle challenges of informal administrative cultures in professional capacity. Comprehensive outlook on these topics is necessary and timely. The questions raised are not easy, and we don´t have simple solutions. What is the root cause of everyday corruption in the law enforcement, for instance? How to facilitate integration of migrants into the receiving societies? What type of criminal activities both the official and unofficial structures create around migration and displacement? How should we understand informality? Should we have new theoretical and empirical approaches in its examination? We came back from the workshop with new inspiration, which will hopefully help us in our own project. The main bulk of our new empirical material, which we collected in Moscow last year has now been transcribed. It is time to look at what empirical and theoretical dimensions it contains. This entry was posted in Yleinen on 3.4.2018 by aheusala. A new year – new tricks! Rustamjon has started his two-year Marie Curie Fellowship in the Aleksanteri Institute, in the University of Helsinki, but keeps commuting back and forth between Helsinki and Lund, where he has ongoing projects as well. One of them includes a survey on legal culture in Uzbekistan, which he is conducting with colleagues from Sweden. The program offers English language teaching to students wishing to acquire in-depth knowledge of Russia through a global perspective. This implies that we do not merely study Russia as such, but use Russia as a prism through which we can understand globally important challenges, such as climate change, inequality, technological change, etc. Our team members design and teach several courses in 2018-2019. These include ‘Global Processes and Flows in Russia’, coveríng global migration, technological and resource flows in Russia, which we will teach together with post-doctoral researcher Saara Ratilainen and associate professor Veli-Pekka Tynkkynen from the Aleksanteri Institute. We are also involved in the design and teaching of the course on ‘Global Indicators of Governance and Law in Russia’, with associate professor Marianna Muravyeva and post-doctoral researcher Freek van der Vet. Finally, we have designed a course on ‘Globalized Frameworks in Russian Policy-making’ with post-doctoral researchers Meri Kulmala, Anna Lowry and Marina Khmelnitskaya from the Aleksanteri Institute. The new MA Program will mark a shift in the life our team members, as we assume more teaching responsibilities. It gives us an unique opportunity to design new courses in line with the goals of the MA program. It is a priviledge to have such an avenue for the dissemination our research and knowledge to new generations of students. It is going to be a mutual learning experience! In addition, all of us have been preparing for this new chapter in our lives by taking several pedagogical classes both in the Lund University and in the University of Helsinki. ‘Constructive alignment’ has become a new motto in our understanding of learning, course design and assessment practices. The fall semester of 2018 will tell how our new ideas work in reality. This entry was posted in Yleinen on 22.2.2018 by aheusala. Back in Moscow where the weather is rainy and foggy, but life is full of colours. Yesterday, our first full day here started with a discussion over breakfast about the roots of administrative theory in European and Central Asian countries. It seems that Max Weber, with his ideal type bureaucracy, has had predecessors in Islamic theorists, who also dealt with the best way of organizing public administration. Next, we visited a mosque to get a better understanding of the religious aspects of migrant life. It was interesting to hear teaching about proper behaviour with regard to propiska (residence permit). ‘Before entering a home, a good Muslim asks for a permission to enter for three times’, the sermon advised. The believers were reminded that they should focus less on complaining, and instead worry more about their own choices in accordance with their religion. It seems that both the practical role of religious institutions in Russia, as well as the different legal traditions of sending countries need attention in our research. Later we were provided a first-hand possibility to observe an important side of our research topic. While sitting in a popular restaurant to have lunch, we witnessed an investigative operation by Moscow law enforcement authorities, who ordered all present to stay put and provide identification. In the end, the situation was resolved peacefully and our passports were not checked. However, we felt the tension of persons under suspicion. At the same time, one also wonders about the complexities of law-enforcement as well. All in all, an interesting start for our second field work period! This entry was posted in Yleinen on 7.10.2017 by aheusala. Summer break is almost here! It is time to relax a little bit before we start preparing for our next field work trip to Moscow. On the 13th-15th of May, Prague hosted the third European Summit (http://praguesummit.eu/) in the beautiful Lobkowicz Castle. In this third gathering of academics, think tank experts, civil servants and politicians, topics included also migration. The panels gave unanimous support to successful integration as the key to societal security in the EU, where member states have different political and social histories with regard to migration. Our project deals with one dimension of integration in Russia, which is micro level integration to a new legal culture. A simple definition of legal integration at this level sees it as a learning experience in which new arrivals accept and follow new norms and regulations. We also use this definition in our effort, as we look at the rules, which govern migration and Russian labour market, and examine what these rules are, how they are enforced and followed. However, we are also looking beyond the fast changing surface by examining how migrant communities contribute more generally to the shaping of the legal environment in Russian communities and institutions. This is also a reason for our interdisciplinary approach. As we examine ‘living law’ vis-á-vis ‘law in books’, we do not separate different ways of looking at the law, often used in academic studies. The perspectives of ‘law in’, ‘law and’ and ‘law as’ will be included in our analysis. Examination of migration to Russia would be articifial without taking into account the historical legacies of the post-Soviet regions. Our key methods include ethnography which is connected to the empirical tradition of legal-sociology. It underlines the relationship between law and society and utilizes both social and legal theories in analysis. In addition, we try to understand how migrants, who live in the intersection of different legal cultures, construct the meaning of law in their new Russian surroundings. This implies that we try to find out what kinds of understandings of societal life their legal thinking includes. This brief description may already give you an idea of the intellectual and practical dimensions of this project. This spring we have had the chance to talk about our work to different audiences and to get feedback on important points. We will continue this part of our project in the fall, with plans to visit Germany and Spain. Then – back to Moscow! This entry was posted in Yleinen on 28.6.2017 by aheusala. Our first week in Moscow is over. As we have enjoyed the 1st of May sunshine, we are also taking a look at the experience so far. This has been an intensive week, both in terms of collection of interview material and as a learning experience. We have met migrants of different ages, professions, experience of life in Russia, and financial situation. Interview situations are often demanding for various reasons.We are discovering that certain questions, words and expressions are ambiguous or sensitive to the people we meet. This in itself is rich material, of course, since it gives us a possibility to investigate our key concepts from a cultural point of view. We are also becoming more aware of our own limitations and try to develop in the process, as much as it is possible. Getting connected with our main informants is an art form in itself. The approach has to be adjusted in every case. The practical conditions make research also an emotional experience, since not everything can be controlled. We have to reflect on our expectations, our ways of working and the material continuously. Does a researcher of migration and shadow economy become an activist? This is one of the main ethical questions of our work and something that we also had to think about during this first week. From the beginning of our project, we chose to remain neutral and keep an academic distance to our topic. Hence, we are not promoting policies or political perspectives. Our original attempt was to look at Russia in a global context which includes a possibility to make comparisons. Such an approach is not easy, but we believe that in the end it provides important insights which might otherwise be overlooked. This entry was posted in Home - Our blog on 1.5.2017 by aheusala. A new year of 2017 has started with active planning of our field work. Our team spent a week together in the Aleksanteri Institute on the 23-27 January to decide timetables for field trips and to organize other practical matters. Among these matters is this homepage, which we will be using actively to tell you about our progress. During February and March, Rustam Urinboyev will be working on the questionnaire for our theme interviews. Our first trip will take place in April-May in Moscow. During our week, we discussed various aspects of conducting interviews and surveys among our future informants. Our team member Rustam Urinboyev´s substantial experience in the field and his ability to teach the rest of our team about cultural differences has already proven valuable. You know – almost anything can happen when you are conducting field studies! You can face all sorts of unexpected situations, some slightly funny, others possible more serious. So, we have to really think about all details very carefully and be fully aware of doing everything right. This involves having proper documents and making sure that our position is that of a researcher. It also involves being sensitive to cultural differences and expectations from our informants. We cannot just walk into somebody´s life and use them for our own benefit. During our joint week in Helsinki, we found out that Rustam had received a Marie Curie Fellowship! His funding will start next year. This is great news, as it further strengthens the study of migration, shadow economy and legal culture. This entry was posted in Yleinen on 15.2.2017 by Susanna E K Peltonen.